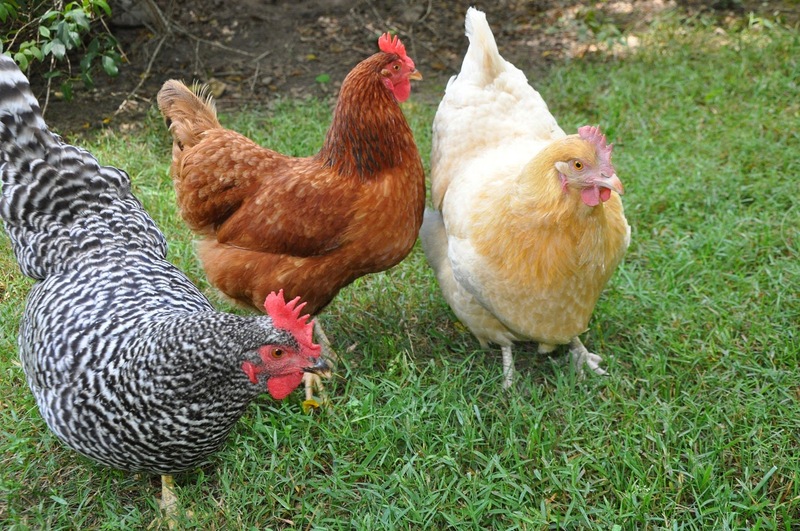 Free Range Chickens = Free Entertainment! By Rebecca Nickols on June 23, 2012 Visit Rebecca's Website. When I’m not at my paying job, as a nurse, I’m usually outside working on the planters, wreaths and living-roof birdhouses we sell at our local farmers’ market. My seven free range chickens not only provide me with the freshest best tasting eggs available, they also provide an endless supply of live free entertainment! My Buff Orpington, Henrietta, after five weeks of non-stop broodiness has finally left the coop and re-entered the world of the living. None of the attempts I tried to break her broody behavior worked, she decided on her own (literally overnight) that trying to incubate non-fertilized eggs was unrewarding. 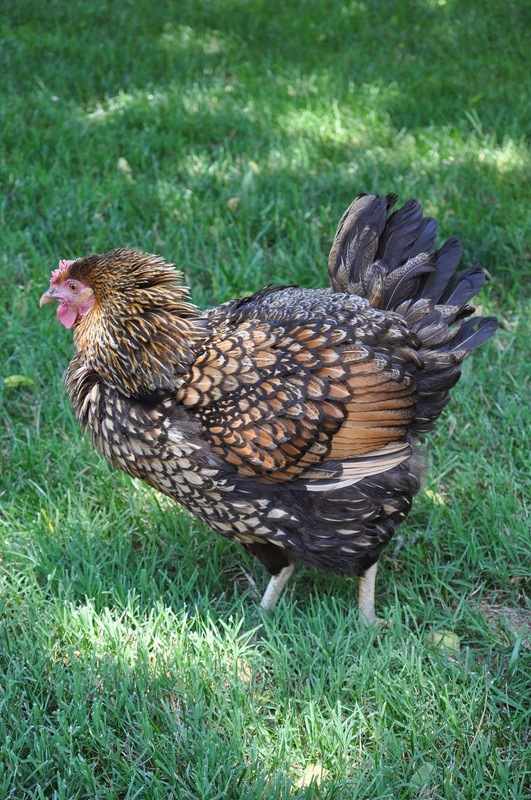 She looks a little rough after 5 weeks of little activity, food or water… She’s lost weight and her comb looks shriveled-up and pale, but she’s finally rejoined the other free ranged hens and has reestablished her position as queen of the roost. My younger flock is testing their boundaries as free range chicks. They’re hesitant to go far from their chicken-tractor home, but are full of curiosity and love scratching and foraging for bugs and such. 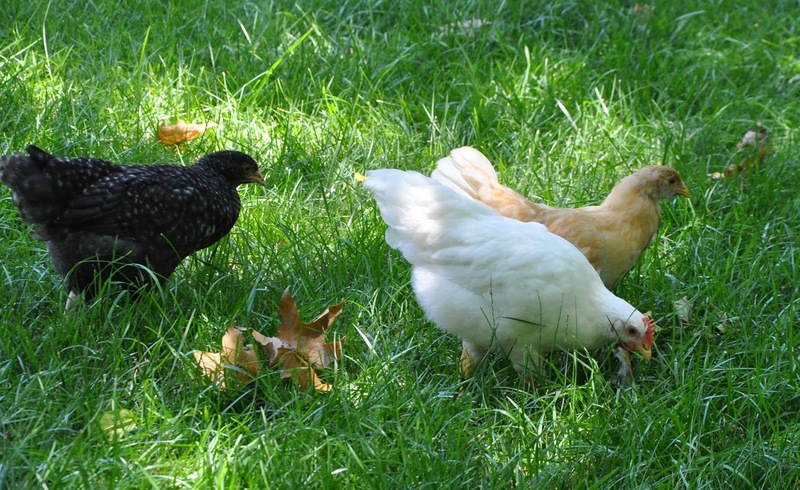 The largest pullet of the younger chicks is a White Plymouth Rock that my daughters named Eleanor. She’s taken the position as the leader of this small flock and Henrietta has already noticed that she might be in danger of someday loosing her spot as the dominant hen. 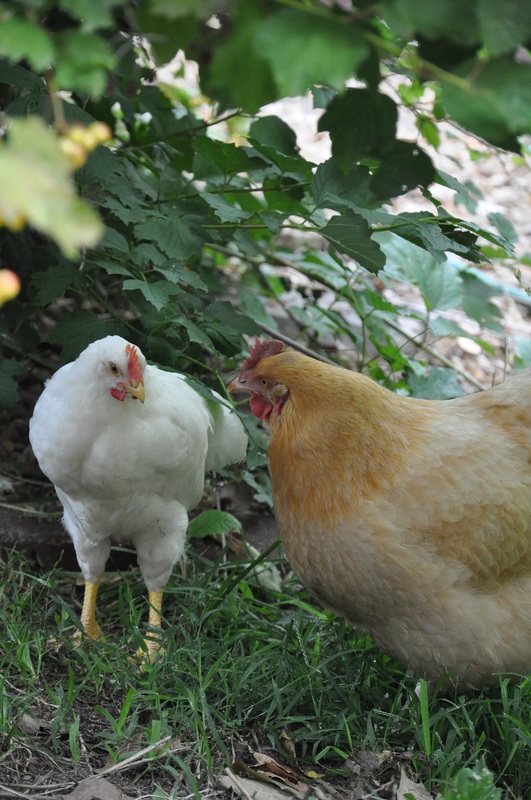 I watched as Henrietta tried to intimidate Eleanor by staring her down and pecking at her… Eleanor didn’t budge; I think Henrietta’s met her match! 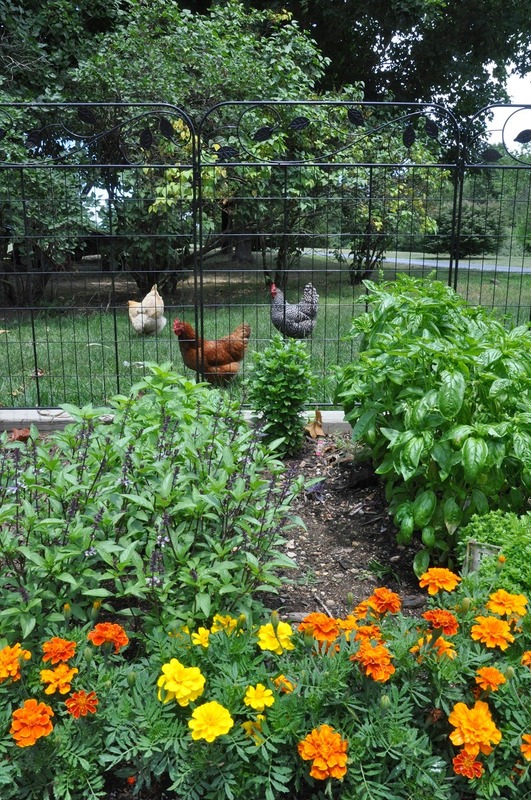 Last fall I spent a lot of time trying to chicken-proof my gardens (Gardening with Chickens), but came to the conclusion that fencing in my garden was the best (or only) option. This has proven to be a success! My garden is productive and beautiful and I haven’t had to worry about the girls scratching up newly planted seeds or dust bathing in the middle of a row of beans! 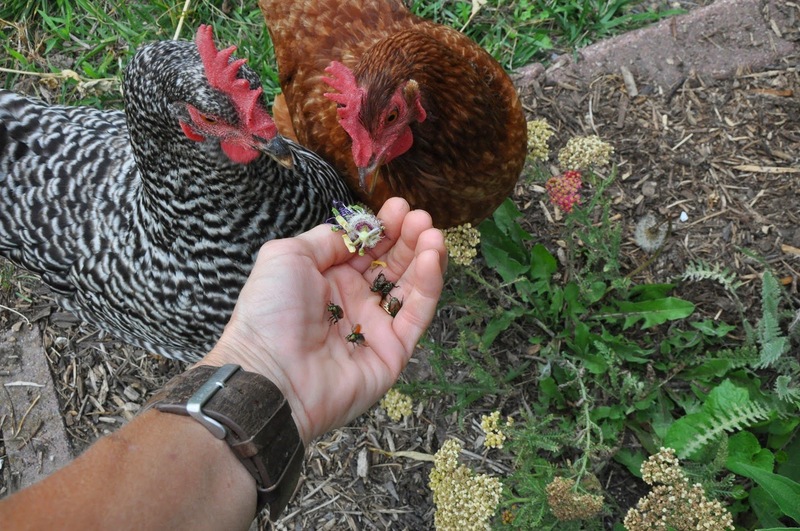 The Japanese beetles (Beetles, Berries and Buffs) are back and the girls are excited to see me when I hand pick them from my blueberry bushes–they know that I enjoy watching the beetles meet their death at the chicken’s delight! 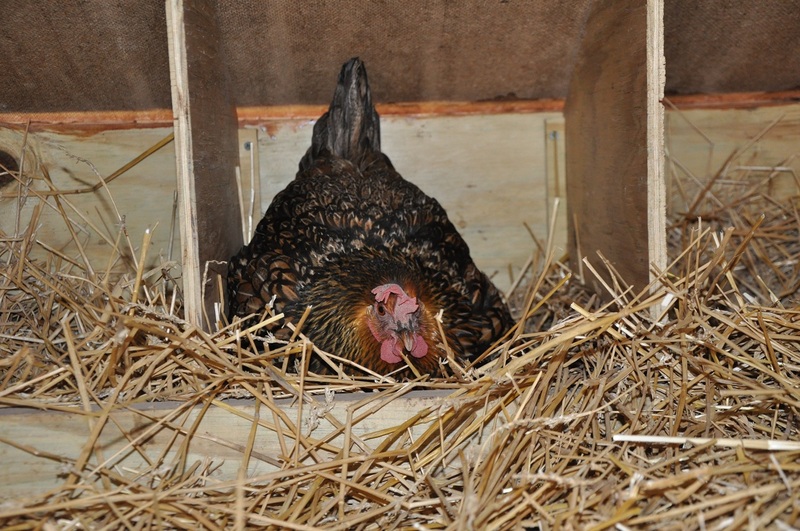 I am so glad I found your update on broody hens, as my Barred Plymouth Rock went broody on me 4 weeks ago, sitting on imaginary eggs. I was not sure how long this was going to go on, but I see your Orph went 5 weeks, so I expect Hilda will match or take it as far as she can, even though I roust her out of the nest twice a day to make her eat or drink. Fortunately, none of my other 3 have followed her example, in fact avoid their PMS sister. I was concerned about Hilda’s health, but see from your experience that this is to be more expected than feared. Thanks for sharing and easing my mind.